It always goes down to the last minute doesn't it? With a holiday on Monday and us closing on the new house bright and early Tuesday morning, today was the last day for everyone to get their ducks in a row and complete any last minute paperwork. We believe everything has been taken care of, but I'm sure there will be some sort of surprise on Tuesday! Since I do not have any of my pantry staples here at the temporary place, I did have to make a run to the market this afternoon to buy at least 7 of the ingredients to make this Thai Chicken Sauté for dinner tonight. Once I got some floral brown jasmine rice, mixed with a few tablespoons of wild rice, bubbling away on the stove, lean sliced chicken breasts are tossed with cornstach and fish sauce. This chicken mixture is then quickly cooked in a healthy glug of canola oil until the chicken is almost done. The chicken is removed and a few thin slices of onion are softened in the same skillet with a touch more oil. Garlic and fresh ginger are added and once you smell their fragrant aromas, the chicken is tossed back into the skillet, along with coconut milk, Sriracha, a dash of sugar and bright lime juice. Once heated through, the mixture is served on a bed of the nutty rice to soak up the savory sauce. As the cornstarch gives the chicken an ethereal crust, it also helps thicken the sauce, while the fish sauce that was mixed with them brings a light salty bite to the dish. With a full two tablespoons of spicy Sriracha, the saucy coating is fairly hot, but it is tempered by the addition of cool and creamy coconut milk. You could get away with a heaping tablespoon, but the added flavor it brings is worth a little sweat. The squirt of fresh lime added some depth to the sauce with a garnish of chopped cilantro to finish the dish with a fresh flavor. Bah... who needs a mixer? Yes, I did manage to bake yesterday so Jeff could keep the tradition for the Weekly Wednesday Treat Day going. We thought about changing official Treat Day to Monday instead so we could start the week with something tasty, but we decided to keep it as-is to hopefully help with any mid-week blues. However, we may not be able to do it next week as we should hopefully be moving into the new house! I was so used to just whipping out a mixer to get things done that I thought I would be fairly limited in what we could make in this temporary place out here. I still needed something fairly easy though, so after some thought, I decided I would try to make Mint Chocolate Squares with some of those minty Andes Crème de Menthe Baking Chips . The first thing you do for these squares is make a dough that will end up forming the base and will be also used to create little buttery golden nuggets on top. Sometimes recipes like this will call for you to pre-bake the crust - I decided not to do that here, which gave me some interesting results in the final product. When I usually give them a pre-bake, the crust typically comes out a little more crumbly and it is not always easy to get clean cuts. This time, when I didn't pre-bake, the crust was still golden and very firm, yet it was just tender enough to easily cut through to form clean and tidy squares. The filling is an effortless combination of thick sweetened condensed milk and those minty chips - they are heated together just until the chips melt, darkening the pale milky liquid. A splash of vanilla and a handful of toasted chopped walnuts round out the filling with a sweet nutty crunch. The filling completely solidifies during the baking process, yet retains a softness that allows you to easily sink your teeth through the squares. If you don't groove on chocolate and mint, you could certainly use a dark chocolate for a cleaner flavor. I will have to remember how simple these squares were to whip together when bake-sales pop up or I need to get a quick treat together. Before we packed up and left for Minneapolis, we made a few plates of treats to take over to friends and neighbors as a "thank you for being there" gift from us. 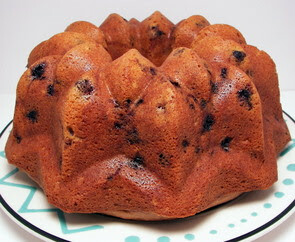 Besides a few cookies and muffins, I also thought it would be nice to make this Blueberry Pound Cake to send along. I think the title of this recipe may be slightly misleading as this is not a true "pound" cake - this version is a lighter take on the more caloric versions. Instead of using completely butter as the fat, smooth cream cheese is added to keep the cake from being too dry. For additional moisture and to ensure this cake has a tender crumb, a cup of lemon yogurt is the liquid component that brings the cake together. You can use plain yogurt if you wish, but since lemon and blueberries have an affinity for one another, you might as well use this as an opportunity to add another layer of flavor to the cake. While not as dense as a traditional pound cake, don't let that stop you from giving this recipe a try. The texture is not all that different and the cake is still quite moist inside that beautiful golden crust. The juicy pockets of blueberries are very welcome against the soft cake - I used frozen wild blueberries, but please feel free to use fresh if you can get your hands on some. Just be sure to toss them with a bit of flour as directed in the recipe to help them grab onto the batter and not sink to the bottom. I used my regular bundt pan as you can see, but you can use a 10" tube pan and it would work just as well - you just may need to adjust the baking time slightly. While I dusted the top with a layer of confectioners' sugar just before we delivered the plates for an added touch of sweetness, you could also glaze the cake, while it is still slightly warm, with a mixture of confectioners' sugar and enough fresh lemon juice to thin it out. We were exhausted by the time we got home from the fair yesterday - I was all ready to get the post up last night, but nodded off not too long after finishing dinner! There were plenty of exhibits that we didn't get to see, but we did make a good dent and did quite a bit of walking. We took a fair amount of pictures so we could show you some (mostly food) highlights if you couldn't make it out this year. As always, you can click on the photos to see them in their larger form if you have trouble seeing everything in them. We got there fairly early in the morning, but that did not stop Jeff from making a dash to his favorite stand where they sell the infamous pork chop on a stick! He has gotten this every time that we have gone but I've never tried one until this trip - it was much better than I was expecting. It was juicy, smoky, pretty tender - the blend of spices (that they of course sold separately) made you want to lick your fingers clean and forgo a napkin. I now see what Jeff was talking about... this will be on my must-have list next year. Once that was out of the way, we spent a good deal of time strolling around checking out all of the different food stands. One of the first ones we saw was the obligatory cream puff stand - fairly large line for this one at 9am. A little farther down we came across a very empty Hot Dish on a Stick vendor - wonder what that is? It is basically a tater tot hot dish on-a-stick with a cream of mushroom dipping sauce. They also sold the "Uff Da treat" - a filled krumkake topped with caramel sauce and butter roasted pecans. Next were the Scotch Eggs and Meatballs on a stick. This stand had a sign up to let you know what exactly you were getting yourself into if you ordered either of them. There did not seem to be much of a line at this next one... too odd for some maybe? There are a couple different vendors, but we like Tom Thumb the best. Most everyone coming from the cookie building were walking away with one of these pales... I can't imagine eating that many cookies! Where we got some fantastic salty and greasy fries, we did not however get this many - we got the little cup! I swear! Later on, once we recovered from the fries, we decided we should go healthy and make a pit stop at the Kashi booth - they had lots of samples and coupons. They also gave us a nifty tote bag... woo! I'm sure Paula Deen would be proud if she would have came to see them carve the face of the Princess Kay of the Milky Way winner out of a 90 pound block of pure butter. And as you can see, this piggy didn't disappoint - that is one large animal! This is what the crowd looked like as we tried to navigate our way back to the car - it got extremely busy and very hard to move around... and this was only around 1pm! Oh, and before you ask - no, we didn't eat at all of the places we took pictures! Before we head off to the fair this morning, I thought I would let you know I have gottem some blog maintenance out of the way. The first and major update is to the recipe section. I have finally brought it back up to date, cleaned up messy code, re-organized the lists and added new categories. I hope it is a little easier to find specific recipes now - if you have any problems with the links, please let me know. If you don't see the updates when you click on the recipe sections to the left, be sure to hit refresh on those pages. I have also started to update the cookbook list again, so look for more additions soon. We added the new weather block on the right hand side for Minneapolis as well, it is a little more fun than the dreary blue one we had before. The next update will be to the link list - I'll be cleaning up outdated links and adding some new ones. I thought about changing the template, but we quite like how clean and (hopefully) easy to read it is. *Just a quick addition - since we moved, I've had to update my e-mail address as our old internet provider does not provide access where we will now live. We went ahead and bought a domain (a kind of catchy one at least!) and I've changed the address for the final time. I don't know if we will move the blog to the domain at all, but at least we will have a permanent e-mail address. If you want to get it, it is linked on the right hand side under "Have a question?" We will be going to the "Great Minnesota Get-Together" this weekend and we are pretty excited! It has been years since we have been to the Minnesota State Fair - I'm sure Jeff will make a bee-line for the pork chop on-a-stick stand... that is a must-have for him. We'll try to get a post about it up on the site Sunday or Monday. While I've been cookin' along in the apartment, I have been heavily relying on old favorites that are dead easy to make or don't really have a recipe - however, I did pick a new recipe for us to make for dinner. I picked up a large pack of chicken from Costco today so I could portion it out and get it in the freezer, but I left a pound out so I could make tonight's dinner of Spicy Soba Noodles with Chicken in Peanut Sauce. With a generous base of chewy buckwheat (soba) noodles, this nutty dish was quite filling and satisfying. 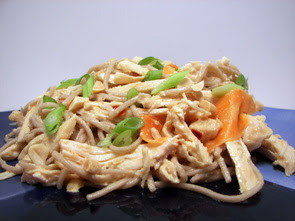 Threaded with thin strips of bright orange carrots, the noodles are dressed with a creamy peanut sauce. Thick peanut butter is thinned out with chicken broth and is then seasoned with soy sauce for a salty edge, a garlic clove and fresh ginger for a spicy bite. Crushed red pepper brings just enough spice when balanced wwith a bit of sweet honey to bring a gentle note of heat to the dish. Sliced fresh green onions are tossed on top along with a smattering of crunchy peanuts for the finishing touch to tie in with the sauce. This kept us well-fed for tonight with enough leftovers for lunch tomorrow. While the shredded chicken added a hearty element to this dish, I think we will have to try this meal again with some grilled shrimp for a more delicate flavor. I know not everyone may have access to soba noodles, so if this is you or you just don't like the texture, you could use whole wheat spaghetti instead. I think it is finally safe to say that we have found a house! After looking at a very large number of places, we made an offer a day or so ago and have been negotiating the final details. We all agreed on the deal yesterday and it looks to be a go! Of course, we still need to get the inspection out of the way, but if all goes well, we currently have a closing date of September 4th. That date is much sooner than we thought we would be able to get in, but we are glad we can get our belongings out of storage and into the new house! It is probably a little further south than we were initially prepared for, but the house had only been on the market for 1 day(!) and we didn't want to waste any time. While I can't say that is holds my dream kitchen, it is workable - it was the rest of the house that sold it for us. It had a lot of the things both of us have always wanted, but never thought we could find and afford! I hope to get some pictures posted of the inside soon - it just depends on how smoothly the closing goes! So it is Wednesday today.... I wonder if any of you are thinking if we did any baking for the Weekly Wednesday Treat Day? Well, guess what... we did! I was going to wait until we got into a house to start this up again, but I just couldn't wait that long - is that sad or what?! I did have to go out and buy a bunch of supplies just to bake these Soft Baked Butterscotch-Chocolate Chip Cookies though. Since I don't have my mixer yet, I had to make sure whatever I made could be done in a simple bowl with a sturdy wooden spoon. It has been ages since I've done a cookie without a mixer, but it was dead easy and actually quite fun to mash the ingredients together. These golden rounds are for soft cookie lovers - while these cookies are not cake-like at all, they also have no crispness to them either. One thing I liked about these is you can bend 'em in the middle without the cookies falling apart - they have a slight chewy factor with a strong butterscotch undertone. If you scan through the ingredient list, you may perk up when you get to the instant pudding ingredient - it may sound a little weird, but it gives the cookies a brilliant tenderness and backs up the flavor the butterscotch chips add. You also want to be sure and use a good tablespoon's worth of quality vanilla - I think the added dimension the vanilla brings is needed to keep the flavor of the butterscotch from being too overwhelming. 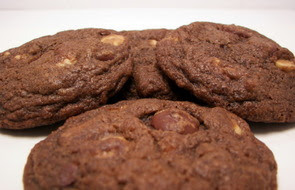 You can play around with the butterscotch and chocolate chip amounts to suit your taste, but we both thought that this was just the right amount for these cookies. 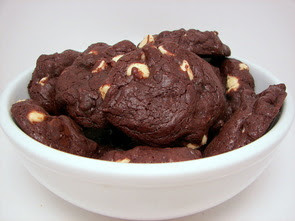 You could also toss a handful of toasted nuts into the dough, but in a soft cookie like this, we thought that the crunch would be too much of a distraction. So we are doing our best to get back into a "routine" around here, but it is not very easy when you are cooped up in a room rather than a house that one is used to! We looked at a lot of houses this weekend, we browsed though at least 20 or so... this is the fun part, but I'm not certain we have come across "the one" just yet. It's too bad we couldn't take a kitchen here and a backyard there from some of the ones we did like and mash them together... isn't it always like that though? I did bake a few snacks for our driving trip from the east coast to Minneapolis - one of them happened to be Jeff's favorite muffin. 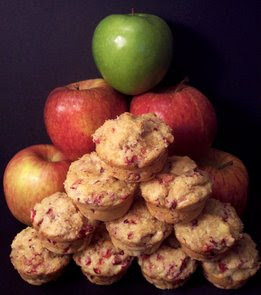 I first made them back in November of 2005 and I've baked these Cran-Apple Muffins probably a dozen times since then. It also received bonus points for using up more of the cranberries we had stashed in the freezer! They made the trip unscathed (aside from a few of them being eaten!) and the rest went into the freezer here to enjoy for the next week. I have a list of new recipes that we made before we left to get posted, but between looking at houses and trying to get reacquainted with the area, I'm not quite sure we will be busting out many (if any!) new recipes until things settle down. 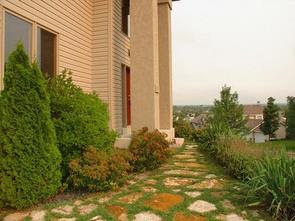 Hopefully things will move quickly on the house front and we can get back to our normal schedule - wouldn't that be nice? 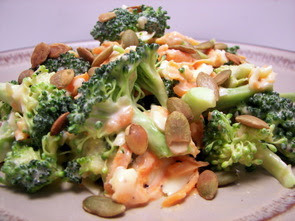 One of those new recipes I made a few days before we left was this Broccoli-Cheddar Salad with Toasted Pepitas. One of the reasons I wanted to make this salad was I could make it ahead of time and stash it in the refrigerator until the next day when we would have it. I gave it a taste after I tossed the ingredients together and it tasted good, but it was much better the next afternoon once the flavors had time to develop. Coating the crunchy broccoli is a generous creamy dressing made from mayonnaise mixed with plain yogurt to lighten it up - apple cider vinegar and a dash of sugar are also added for a sweet tang. To add a bit of color and texture to the salad, shredded carrots and finely diced red onions are tossed in with a good dose of Cheddar for a sharp bite. Right before serving, a handful of toasted pepitas add another crunchy dimension to this satisfying fresh salad. I've actually made this salad again since we've been out here - it is dead easy to toss together and takes just a couple minutes to get in the refrigerator the night before. Oh man... that was a long drive! *If you were unable to reach us via e-mail today, I apologize as there was a mix up (ugh, big surprise) between us relocating and our former cable company. The issue has been resolved and our e-mail access is back, so feel free to shoot us another note if you sent us anything today. We drove up to Pittsburgh on Wednesday afternoon to see the pups and kitty at Jeff's Moms house - we stayed the night there and headed out towards Minneapolis Thursday morning. We were going back and forth on how long we should drive that day and when we got to the hotel in Janesville, Wisconsin, I still felt good so we decided to just to the drive in one day! I say "we", but I drove the entire way as Jeff was browsing through the maps, nodding off or working on a couple sudoku puzzles! 15 hours and just over 1130 miles later we arrived in Minneapolis! Whew - my back was pretty sore by the time I went to sleep! Not wasting any time, we are meeting with Lori our new Realtor friend and will spend most of this afternoon starting our house hunt! We are probably going to be at a hotel for the next couple days before we move into our furnished corporate apartment - maybe then we can actually cook again! I am going to do my best to keep the blog updated as often as we can, but I just don't know how much time we are going to have until we get somewhat settled in. I will get caught up on the comments and e-mails as soon as we get back from house hunting tonight. I do have something for you today though! A day before the packers and movers came, we thought it would be nice to have a plate of cookies for them to snack on. Because I was still trying to get some of the pantry staples used up, I had to be choosy with the recipe as I didn't want to have to buy anything new for it. After rummaging through the pantry to see what we had left, I found a recipe for Mocha Mudslides and used up the last of the cappuccino chips, brown sugar and butter... bingo! 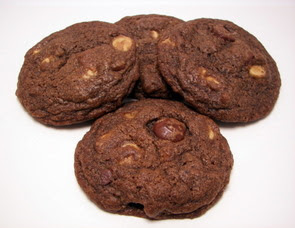 This cookie gets a boost of chocolate two ways, once with natural cocoa powder in the dry ingredients and the second from a good dose of bittersweet chocolate chips. To give them that mocha chocolate/coffee combo, a heaping tablespoon of instant espresso powder is added when you are beating the base butter/sugar mixture. The chunky cappuccino chips also bring their own "coffee" depth to the cookies - right out of their oven their flavor is fairly mild, but we noticed that the coffee factor crept up the longer they sat. The cookies have a smooth rich flavor with a firm chewy texture - I don't think I would necessary call them "crisp", but they were not soft and they were not hard either. Since we used a few tablespoons of shortening, we baked them right after mixing and they flattened out just enough without going too thin. If you feel like you have to use all butter, you may want to chill the dough for at least a couple hours before you bake the cookies. 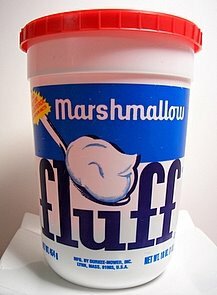 From Oreo brownies to fluffernutters... our last night in Maryland! I had a haul of chocolate in the pantry last week that I needed to get used as most of our things will be packed away in storage until we find our new house out in Minneapolis. I was going to choose a new recipe, but then I remembered that we wanted to bring our Realtors a treat to thank them for all the hard work they have done. It took me less than a second to decide to get a batch of the Outrageous Oreo Crunch Brownies in the oven - one of our most favorite and requested recipes. I have posted about them twice already on the blog, but I have made them countless times for several events. 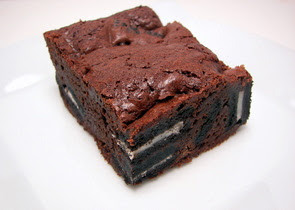 It sure made a dent in our pantry - a pound of butter, over a pound of chocolate and a full package of Oreos... incredibly rich, fudgy and over the top yes, but oh so worth every. single. calorie. Here are the chocolates and butter all melted... it took all of my self-control to leave the mixture alone and not take quality-control samples! 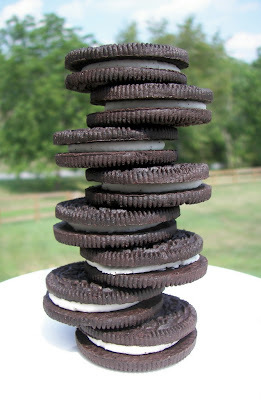 This time we did not use those orange Oreos since it is not quite Halloween yet (even though all of the grocery stores are strewn with Halloween candy and decorations...), so we just went with the good ol' classic kind. Okay, maybe the entire package didn't make it into the brownies - a couple of them quelled the rumbling I had in my stomach while we were taking pictures! Here's a snap of the finished brownie - I love how clean these brownies cut! You can halve the recipe if you want, but I always make a full batch and keep the extras in the freezer. They hold well and make for a quick dessert when unexpected company arrives! So, early this morning the movers arrived and now all of our thing are packed and loaded on the large semi. We're sitting here tonight in a totally empty house except for our laptops, a small TV and a few things we kept aside that will come with us as we start the long drive tomorrow. We already finished all of the leftovers, so what did we do for dinner tonight? Rather than trying to find someplace to eat out, we decided to just have one of our favorite comfort foods - fluffernutters! Just a couple slices of soft whole-grain bread slathered with homemade peanut butter and of course, a few spoonfuls of sticky Marshmallow Fluff. They do have Marshmallow "creme" out in the Midwest, but they don't sell this out there (not that I remember at least), so we did make sure to buy a few tubs to take along with us! We had lots of fun out here, but we are looking forward to our next adventure in coming back home to Minneapolis! Lots of great memories here - especially doing our first total kitchen renovation! Figures, we get it just the way we've always wanted and now we are leaving it behind! 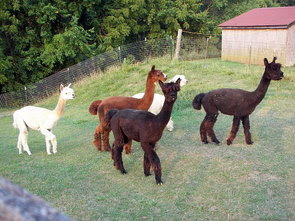 We did make sure to run outside and say goodbye to our Alpaca friends next door - we fed them a few handfuls of grass... Jeff tried to get the movers to sneak one inside the truck, but they didn't think that was such a good idea! Oh well... We may miss a couple days of posting as we will be driving, but we'll post updates as we can! Minneapolis, I hope you are well-stocked with butter and chocolate because here we come! 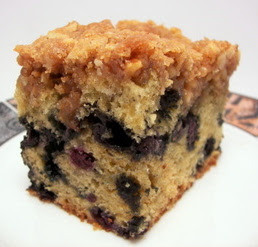 Okay, okay I gave in and your peer pressure made me do it... yes, I went ahead and made that Blueberry Crumb Cake again! We found a wonderful doctor with a fantastic support staff out here and thought it would be nice to bring them a treat to thank them for everything they did for the short-time we saw them. It also gave me a chance to take another snap of the cake! Yesterday was a whirl-wind of last minute activities trying to get the house prepared for today, but it was also going to be the last "home cooked in Maryland" meal for us. I had a pork tenderloin thawing in the refrigerator and after I ran to the market to swoop up some fresh plums, I made this Pork Tenderloin with Roasted Plums and Rosemary for dinner last night. The plums are roasted on a bed of fresh rosemary with a sharp mixture of balsamic vinegar, water, granulated sugar and crushed black peppercorns - this liquid will transform into a syrup-y glaze later on after the plums are done. For an interesting sweet depth to this sauce, a whole vanilla bean is split and added to the roasting liquid before it is added to the baking dish. 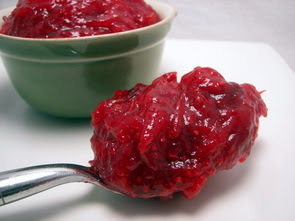 The plums are also given a light coating of granulated sugar on top that ends up caramelizing and draws out their inherent sweetness. 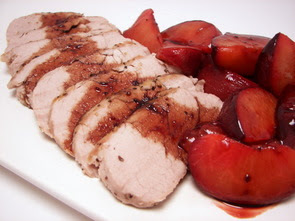 While you wait for the plums to become tender, a lean pork tenderloin is simply seasoned with salt and pepper - it is then seared until golden brown on all sides and then slid into the oven to finish cooking until inside is still slightly pink in the center. As the porks rests, the plums are removed from the baking dish and the piquant sauce they softened in is brought to a boil to intensify and thicken the liquid. The pork is thinly sliced to serve with the plums on the side - a drizzle of the rosemary-infused syrup down the center of the tender pork is the finishing touch to this appetizing meal. The syrup has an alluring hint of vanilla that is hard to describe - in fact, this was one dish where we both were eagerly trying our best to get any remaining dribbles of the tangy sauce off from the plates and in our mouths! While we only got 8 new recipes posted this week, I have such a backlog now as I had a mini-baking spree to try and get ingredients used up. I'll be posting these over the next couple of weeks as we have time, since the movers will be here bright and early tomorrow to get everything boxed up and ready to go. Our favorites this week were the Blueberry Cheesecake Ice Cream and the Edamame Corn Chowder. I decided we needed a break from all of the blueberry and cranberry recipes we've been doing, so what else would I turn to but chocolate? Not just one kind, but 4! The original recipe called for three varieties, but we opted to add a fourth and changed around the title of the recipe to reflect our addition. 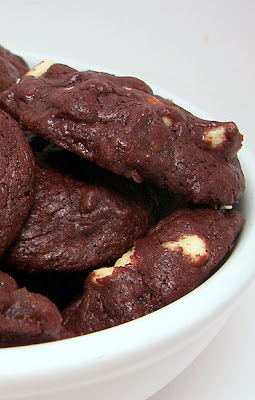 These Quadruple-Chocolate Fudge Ginger Cookies are like rich individual brownies that have a sweet heat from a generous amount of crystallized ginger. 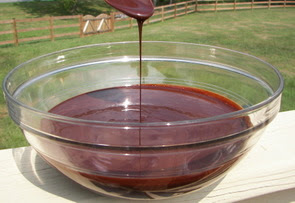 The recipe calls for you to melt bittersweet and unsweetened chocolate with a couple dabs of butter in a double-boiler, which is how we did it, but you could just as well melt them in a microwave as long as you don't over-heat the mixture. So that accounts for two of the four kinds of chocolate - where do the others come in? Once the batter for the cookies has been combined, we folded in semisweet chips, along with white chocolate chips, when we added the chopped crystallized ginger. You could do all semisweet, but we loved the creamy and sweet flavor that white chocolate instills into these brownie-like gems. Bake these just until the cookies lose most of the shine on top - this way the outside will have firm shell-like texture, while the moist insides stay soft and slightly chewy. They will be a little delicate right from the oven, but they will firm up as they cool. It seems if I'm not working on getting the chicken used up, I'm busy with lots of frozen wild blueberries in the kitchen! 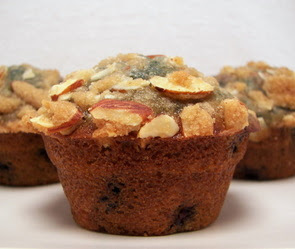 I made these Blueberry Streusel Muffins the other day which Jeff then brought into work (after passing quality control!) to share... his co-workers sure got a feast this week! The streusel for these muffins is a crumbly combination of brown sugar, flour and sliced almonds with a pinch of fresh grated nutmeg for a hint of something special. It is drizzled with just enough melted butter to moisten it and allow the streusel to crisp as it bakes. For the muffin batter, I used a combination of all-purpose and whole wheat pastry flour to keep them tender and light, but you could use entirely all-purpose flour if you like. With a cup of brown sugar, these golden muffins are fairly sweet, but the butter and buttermilk brought a rich counterpoint to keep the sweetness in check. The muffins also have a slight twang to them coming from the buttermilk with vanilla and fresh lemon zest brightening up the background. The streusel that adorns their well-risen crowns added a textural nutty crunch that played off their moist and tender blueberry-studded insides. With everything that is going on involving the impending move next week and getting things in order, dinners will need to be fairly quick to make or at least have little "hands on" time. You can probably expect a slew of chicken recipes as we try to get through the remaining supply in the freezer! While the total time to make tonight's dinner, Chicken, Rice, and Tropical Fruit Salad, was probably around 45 or 50 minutes, most of it was downtime as we had to wait for the brown basmati rice to cook. Since I didn't need to babysit the rice, I was able to get a lot done during that time! I did poach some chicken breasts while the rice was bubbling away, but you could just as easily use a rotisserie chicken if you wanted. I then quickly sliced and diced some fresh pineapple, mango and juicy red grapes while a handful of sliced almonds were toasting. Once the rice was done, everything was combined and tossed with tangy mixture of lemon juice, fresh mint, canola oil and seasonings. 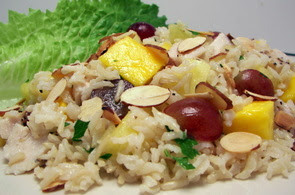 Served on a crisp leaf of romaine lettuce, this nutty rice salad was light and very refreshing with the chunky fruit bringing an addicting sweet flavor to this satisfying savory dish. The documents have been signed! Well we finally have some news to report on the house... the inspections have been done and the contract has been signed - we have officially sold the place! We got off to a very slow start, but there was a boom of activity within the last two weeks and we actually got more than one offer within a couple days! The only problem now is that we find ourselves in quite the time crunch ... the movers will be here Monday to pack up the house, Tuesday to load the truck and we start the drive to Minneapolis on Wednesday. Whew - I can't believe this is all happening so fast! Since we can't bring the pups and kitty (Jeff's mom is watching them) with until we actually find the new house, we are going to first drive up to PA to visit them before we head out. This is the reason we have been trying to push through all of the freezer and pantry ingredients this week so they don't go to waste - I have quite a backlog of stuff we have made that we need to post, so at least the blog won't be completely devoid of postings during the next few weeks. I'm looking forward to the challenge of trying to cook or make anything during this time - we will either be staying in a hotel or furnished "corporate" apartment type place where we will hopefully have access to a kitchen. What kind of kitchen is still unknown... all we might end up with is a microwave! Eek! So until the movers arrive, I plan to keep myself fairly busy in the kitchen making cakes, cookies and whatever else I can fit into the oven to share with friends and neighbors. While I was doing an inventory of what was left in the freezer yesterday, I came upon a flank steak I had completely forgotten about. I quickly stashed it in the refrigerator so it would be thawed in time to make this Udon with Grilled Flank Steak recipe for dinner tonight. This lean cut of steak is flavored with a quick rubdown with a mixture of garlic, fresh ginger, seasoned rice vinegar and salt. Once it has sat around absorbing the pungent mixture, it is drizzled with canola oil and grilled to your liking (we like medium to medium-rare). Just be sure to let it sit for 5 to 10 minutes before thinly slicing it. 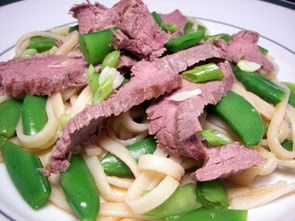 As you wait for the beef to finish, thick udon noodles are cooked just until tender - when they have about a minute left, halved fresh sugar snap peas are added to the noodles just to take the raw edge off. A dressing made from chicken broth, salty fish sauce, vinegar, oil, garlic and ginger (pretty much the flavors from the marinade) are brought to a boil with some fresh scallions added for a light onion-y background. The noodles and dressing are combined to form the base layer with the tender steak slices draped over the top. A scattering of fresh chopped cilantro rounds of the dish with a bright flavor - you could also substitute chopped fresh mint for the cilantro to end with a different note. I mentioned yesterday that Jeff would be bringing in two treats into work today - the first we already mentioned and the second was this Blueberry Crumb Cake I made last night. I apologize for the lack of pictures for this cake - we did get them taken, but somehow they did not get transfered to the computer before we deleted them off the camera?! I wish I could have shown you just how gorgeous this cake was! We did, however, take pictures of the homemade cranberry jam from that intriguing cake and I forgot to put them up - here is a snap of that before we get to the crumb cake. This very tall cake was so light, fluffy and loaded with blueberries that it was hard to just stop at our one sample piece! Perched on top is a bountiful layer of buttery irregular crumbs that is studded with crunchy walnuts. If you make this and want to make life a little easier, you can throw the crumb mixture together a couple days ahead of time and keep it in the refrigerator until you need it. This gives the softened butter in the crumb mixture time to harden up which makes it much easier to break apart to scatter on top of the batter. While I usually recommend to toast nuts in recipes before you use them, I wouldn't here - they are directly exposed to the heat and will have plenty of time to develop that same flavor. With buttermilk in the batter, the cake itself is moist and quite tender - it is lightly spiced with cinnamon and nutmeg with a faint lemon background coming from lemon zest. 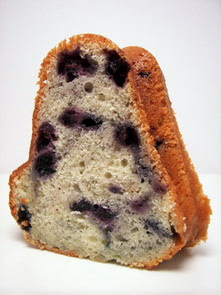 Using fresh juicy blueberries would probably be best if you want to retain that rich straw color inside of the cake - however, I used frozen wild blueberries so parts of our batter were stained as I folded them into the batter. 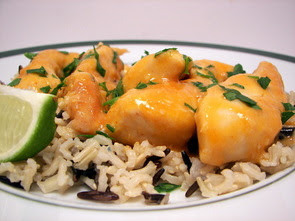 The Sweet and Sour Chicken we made for dinner tonight had a bit of prep work, but it comes together in a snap once that is done, making it a great weeknight dish. Chunky pieces of chicken breast with fresh minced garlic, ginger and crushed red pepper for a touch of heat are sautéed in a glug of olive oil until the meaty pieces have fully cooked. With one and a half pounds of chicken, you will want to make sure you have a very large skillet to do this step - if you don't, I would cook the chicken in batches so they sear correctly and don't stew in their juices. Once the chicken is done, it is removed from the pan with chopped onions and celery being added behind it. After they have cooked until they are crisp-tender, fresh pieces of sweet golden pineapple are added to the pan. 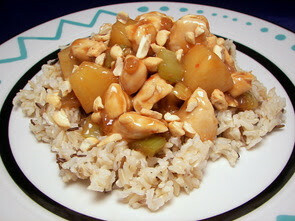 The ever-important sauce of pineapple juice, soy sauce, dry sherry, brown sugar and cornstarch is added into the pan with the cooked chicken mixture. The sauce bubbles away and quickly thickens, coating the chicken and vegetables in a glossy sweet and sour sauce. I didn't have enough of one kind of rice, so I mixed a bit of nutty brown basmati with wild rice to cook and serve as a bed for this chicken dish. For a crunchy finish, we scattered a handful of chopped cashews over each portion. Who loves bacon... we do we do! It was a nutty day around here today!